While I recuperate, I’ll be sprinkling in a few guest posts from some of my favorite personal finance bloggers. This is a guest post from J.D. Roth, who writes about smart personal finance at Get Rich Slowly. Every year, people lament the commercialization of Christmas, yet few are willing to do anything about it. Christmas displays now appear in August. Black Friday’s mad rush only grows madder. But, as Trent has noted, gifts that matter don’t come from Wal-Mart. My wife and I take pleasure in creating homemade Christmas gifts, as do many of our friends. But even these are secondary to the time we spend “playing Santa”, driving around making holiday deliveries to the people we know. As we chat on porches or sit in living rooms, sipping hot cocoa and fawning over children, it’s the bonds of friendship that are important — not the gifts. In fact, I believe it’s rituals like our Christmas delivery that form the heart of a meaningful season. Traditions add layers of texture to your life which last not just during the holidays, but throughout the entire year. My public library carries a great book about this subject, and I borrow it every year just before Thanksgiving. Unplug the Christmas Machine by Jo Robinson and Jean Coppock Staeheli urges readers to escape the commercialism of the holiday season, to make it a “joyful, stress-free” time for the family. As early as the age of four or five, [children] can lose the ability to be delighted by the sights and sounds of Christmas, only to gain a two-month-long obsession with brand-name toys. Suddenly, all they seem to care about is how many presents they will be getting and how many days are left until they unwrap them. A relaxed and loving time with the family. Children need relaxed attention. During the holidays, normal family routines are temporarily set aside for parties, shopping, and special events. It’s important to slow down and spend quality time with your kids. Realistic expectations about gifts. Kids enjoy looking forward to gifts and then having their expectations met. The key is to manage their expectations. By educating them about what “Santa” can afford, and is willing to give, it’s possible to prevent disappointment on Christmas morning. An evenly-paced holiday season. The modern Christmas season starts months before December 25th, when the first store displays go up. Things end with a bang on Christmas day. The authors suggest beginning the season late in the year instead. Get out the Christmas music on December 15th. Pick out a tree on the following weekend. Schedule some low-key family events during Christmas week. Stretch the season to New Years Day. Reliable family traditions. 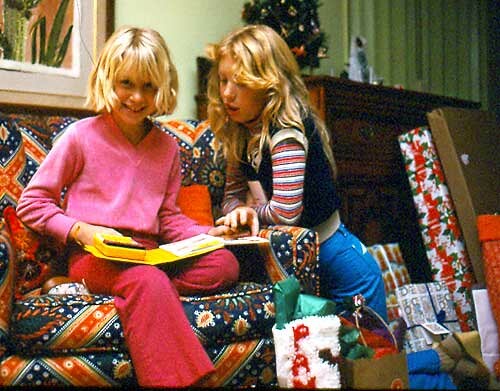 When I talk to my friends about what Christmas was like when we were Children, it’s not the gifts that we remember. We recall the things we did as a family. I remember sleeping next to the tree every Christmas eve, but never being able to catch Santa in the act. I remember seeing the cousins. I remember decorating the trailer house. Your kids will remember the traditions, not the gifts. That last point is so important: it’s the traditions that make this season special, not the gifts. Lynnae from Being Frugal recently produced a video highlighting one of her family’s traditions. “To count down the days until Christmas, I wrap up 24 of our favorite Christmas storybooks…Every night before bed, my children get to pick out one book from the stack, and we’ll read it before bed.” It’s like an Advent calendar made up of books! When I was a boy, one of my favorite traditions was listening to The Cinnamon Bear, an old-time radio program broadcast by a local station every evening at 7 p.m. This was a pre-bed ritual for years, and one I treasure to this day. I know that toys and the games were important to me when I was a child. As an adult, however, the only present that I actually remember was my Evil Knievel Super Stunt Set. All of the other toys are forgotten. But the memories of cooking, cousins, and Christmas lights still remain. Wherever you are and whatever you do this holiday season, I wish you the very best — Merry Christmas.